Four new wide releases join our Long Range Forecast this week as we take a look ahead to Thanksgiving weekend. Life of Pi, Red Dawn (2012), Rise of the Guardians and The Silver Linings Playbook are currently scheduled to open on Wednesday, November 21 to lead off the extended holiday weekend. - Reaction to the film's trailer has been generally positive. - Fans of the novel the film is based on should provide a built-in fan base, though the exact size of that fan base remains to be seen. - This is going to be a huge international hit. Especially in India. That takes some pressure off the domestic gross. - Plenty of Oscar buzz. Reviews out of the New York Film Festival are solid. - While the film has four-quadrant potential, in turn it will have to deal with competition from all of the weekend's other releases. - Life of Pi should lose out to Rise of the Guardians in a big way when it comes to mainstream family audiences. - The presence of Chris Hemsworth and Josh Hutcherson. - Could get an added boost from patriotic crowds. - The poor history of other recent 1980s remakes at the box office. - Skyfall will provide direction competition for those not in the mood for a family film over Thanksgiving weekend. - Opening during Thanksgiving weekend should be perfect timing for this holiday-themed film. - Outside of The Hobbit: An Unexpected Journey, the December schedule doesn't have a lot to offer family audiences this year. That could prove to be a big help to the holding power for Rise of the Guardians. 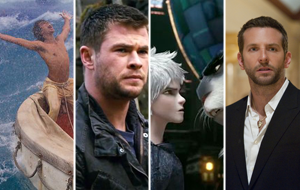 - DreamWorks Animation has a steady and dependable box office history with it's recent fall releases (Puss in Boots, Megamind, Madagascar: Escape 2 Africa and Bee Movie). - Opens shortly after Disney's Wreck-It Ralph. - Of the two films, Wreck-It Ralph is more likely to appeal towards non-family audiences. - Bradley Cooper and Jennifer Lawrence could prove to be a bigger draw together than they have proven to be on their own. - With David O. Russell as director, odds are strong that it will be a good film. - Plenty of Oscar buzz right now. The film is considered by many to be a lock for a Best Pic nomination. A lot of Oscar pundits are also touting performances by Jennifer Lawrence and Robert De Niro. - Cooper and Lawrence are coming off lackluster box office performances this fall, Cooper more so than Lawrence. - The film will could have a very hard time appealing to Lawrence's teenage heavy fan base. Notable changes on our forecast this weekend include Frankenweenie, Taken 2, Pitch Perfect, Here Comes the Boom, Seven Psychopaths, Argo, Alex Cross and Cloud Atlas.